Return Policy: 100% Satisfaction Guaranteed! 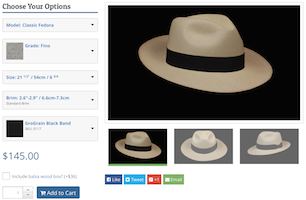 If your Panama hat was damaged in shipping, if it does not fit, or you are just not happy, return the Panama hat for replacement, if available, or contact us first before returning. The buyer is responsible for shipping charges. When placing your order with a credit card, we will not bill your card until the day we ship your order. Orders placed using PayPal are charged immediately. Shipping times vary greatly- some orders are in stock and can ship in a couple days, while others we have to build specially and yet others have to be specially woven to fit the customer's specifications.